In February I wrote an article about some of the difficulties I faced emotionally when I visited a school for severely disabled children for the first time. Today (actually this visit was in July, I just forgot to post this. My bad! haha) I visited the school again, for my second visit this year. I would like to share some of my stories with you. The first thing I noticed today as I was sitting in the parking lot psyching-up, was the morning school drop off. A mother walking her son across the road before being shooed back to the car; the classic “I’m fine mum.” A father carrying his daughters bags as they walked together slowly towards the entrance. The teachers and helpers lined up at the entrance, helping students out of cars, into wheelchairs and greeting them for another day of school. This is a rare sight in Japan where students are usually expected to bike or walk to school. However, in this little corner of Miyazaki it is the norm with four schools for the disabled grouped together, forming a small community. It might sound cheesy, but what caught my attention the most was that every parent and every child were smiling. Japanese people don’t smile enough. I smiled all day. Some moments were more forced than others. It was super easy to smile in my first class. We played the game Fruit Basket. Anyone who is familiar with the game will know that students are each given the name of a fruit and sit on chairs in a circle. One student stands in the middle of the circle and says the name of a fruit. All the students who are that fruit will then leap up and try to find a new seat, hoping not to get stuck in the middle. If ‘fruit basket’ is called, all the students must find a new chair. In our version, instead of chairs to sit on, we laid coloured cards on the floor. The students were each given a fruit, and when their fruit was called they had to navigate to a new card. The students had a ball. There were wheelchairs, rolling beds, and helpers everywhere. The game was about strategy rather than speed, which card would be the easiest to get to, especially when ‘fruit basket’ was called. Natural smile 100%. Second period was with the most severely disabled group of junior high students. Some of the students can understand simple questions and respond with movement or facial expressions. It is possible that some of the students remembered me from last time. The teachers remembered me at least. The biggest hits were my toy koala and kookaburra that laughs. The students seemed to enjoy the texture and noise. We sang Heads, Shoulders, Knees and Toes and played London Bridge is falling down. Helpers pushed their students around in a circle, and under the “bridge” (a coloured cloth). When the song ended, whichever student was under the bridge at the time was caught. Due to all of the teachers wanting to stop at the bridge to take pictures, we decided to change it the rules so that the bridge only fell down at the end of every third round of the song. Half way through we hit upon the idea to change the coloured cloth to my Australian flag. This required another round of pictures. The class ended with a group picture. I found myself looking for tiny reactions in the students, it’s really the only thing you can do. No reaction doesn't mean failure, it means try again another time. Lunch was with the high school students. Students are divided into classes depending on the severity of their handicap. There is only one class of students who are able to verbally communicate in the high school, so I ate lunch with them. The girl who could speak really decent English graduated in April this year, so I lost my translator. No matter how hard I try, it is really challenging to understand what the students are trying to tell me. Their speech is quite severely impaired, and my Japanese is just not good enough. I end up having to look to the teachers sitting with us to repeat what the student said. They don’t mind at all of course, and I suppose I shouldn't beat myself up about it. I have two students at my regular school that have speech impediments as well, and I see it as my personal goal to understand what they want to tell me. It is so hard in Japan to get students to talk you sometimes that I don’t want to waste a single flare of courage that they show. It’s a working progress. I accidentally startled one of the boys at lunch when I coughed. Milk went everywhere. Luckily five minutes later another teacher did the same thing, so it wasn't just me. The student pretended to get angry at him, but couldn't keep a straight face. There is always time for a joke or two. I had an afternoon class with the same students I ate lunch with. I did my self-introduction lesson for them using a power point and then we practiced saying the colours in English. The homeroom teacher is fantastic. He started in April, so this was the first time I had met him. He arranged for a spare wheelchair so that I could participate in the game with the students. We raced around the classroom in wheelchairs searching for the colours as they were called. I had a ball! The kids loved it too. After the class finished a teacher from the audience requested that I sing “Let it Go” for the students. This was followed by a touching duet performed by myself and the teacher who requested “Let it Go”. We sang “A Whole New World” from Aladdin. It was beautiful. The teacher can’t speak a word of English but somehow he pulled it off. I was impressed. The homeroom teacher said that next time I come to visit he would like to have the students teach me how to make Japanese tea. I can’t wait! All in all, I felt much more positive about this visit. I didn't visit any of the high school students who have severe disabilities or the elementary students, so that may have been a contributing factor. However, I still walked by their classrooms and saw them in the lunch room. I don’t think I will ever be able to look around the lunch room and not feel a little uneasy as kids eat through IVs or are fed by helpers. What I have learned to do is to look at the teachers or helpers instead. They are the most incredible people; always smiling and happy. Even when I couldn't understand a word one of the students just said to me, somehow their teacher caught it perfectly. There are probably very few people who could do their job and I respect them immensely for it. 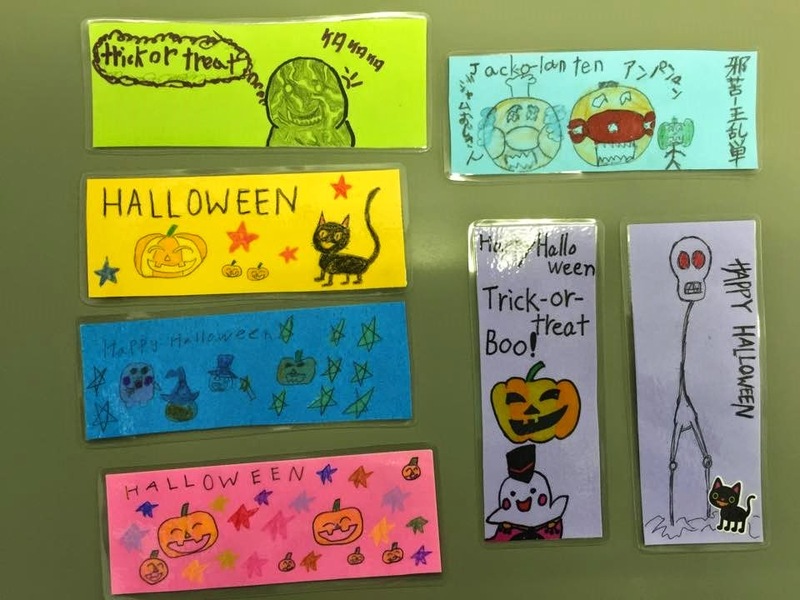 Halloween bookmarks that I made with the kids at my regular school for kids with long term illnesses.